Use a structured challenge like the AZChallenge to lend form to your dialy writing practice. One of the things that can hold a writer back from a regular writing practice, is the lack of a way to structure the output. Perhaps you write every day, aiming for a target of 100, or 500, or 1000 words. But without structure, it can seem random, maybe a little pointless. What are all these drabbles you are turning out? How would they ever form part of a body of work you can point to and be proud of? Isn’t it all just writing for the sake of it? Well – yes. Sort of. Writing practice, is exactly that – practice to form a daily habit. So in that sense, it doesn’t matter if your writing pieces are unconnected. However, for a lot of people (including me) that feels unsatisfying. I want to be making progress, and creating something larger than, say, Tuesday’s isolated 500-word ramble. A random bit of TV helped me crystallise what was missing. I saw the songwriter George Ezra interviewed on Graham Norton about his breakout success in 2014. George was travelling around Europe in a gap year, and writing songs. And by the end of his trip, he said, he ‘had this body of work.’ And so he decided to do something with it. He released an album which won awards and generated several hit songs. (All of which I love, by the way, and especially his lyrics, and especially his first big song, Budapest). But that phrase – a body of work – got me thinking. I wanted a body of work. I knew I wanted to write novels eventually, but until then, how could I feel like I was creating a work of some sort? I’m working on my novel, but still need to keep up my other writing practice. Yet I found that turning out wordcount like homework was not satisfying. I realised that what I needed was a theme, a magnet for my words to collect around. 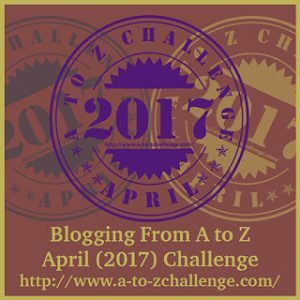 And just as I was wondering, I read about the April AZchallenge, or A-Z challenge. As a way of structuring work, it could not be simpler: write one chapter, short story, blog post or nonfiction book entry, for each letter of the alphabet. Decide on a target per-letter wordcount you can handle, and go. Writing one piece per day would be normal, but I guess it wouldn’t matter how long it took you, so long as you completed all 26. – blog posts on writing – what a great way to spend, say, March! I feel a challenge like this gives a writer an opportunity to grow. When I browse the posts on the excellent My 500 Words Facebook group, I’m inspired by what others are writing. Some are novelists like me, but others write memoir, poetry or blogs on a vast range of topics. I’m really feeling the need to expand my repertoire after months focusing on this one book. A structured challenge like this could be just what I need. Create the daily word count equivalent of an acrostic poem – take a word which is significant to your theme, and write a piece for every letter of it. I’m toying with the idea of a collection of flash fiction called TRUMPOCALYPSE, a series of responses to the regime change in America. Write a set number of pieces on the same theme. Thirteen Ways of Looking at a Blackbird might become Seven Approaches to Night, for example. Or Teacups. Or whatever you choose. Write one piece for every year of your life – or every place you’ve ever lived, or every person in your family. Pull up the current Top Ten hit list and write something inspired by each of the songs on it. Go to the newsagent. Take a snap of the front covers in the specialist magazine section and then use their weird and wonderful headlines as your jumping off point. History Today, Nursing Times, New Scientist. Make anything you like from them. The photo you took is the cover for your collection. You will always have something to write about. You’ll practise discipline, as well as regular writing, to complete the task. At the end, you’ll have a work, a piece of art, conceived and created by you.maybe you’ll share it, maybe not, but it is something, a solid work, with a focus. What could I do for a 26-item A-Z challenge? What challenges keep your writing inspired? What a great idea. I’ve been struggling with this “body of work” thing lately, too. I am nearly done with my first novel, but it took so long. Even if I bust out another in a few years, does two novels make a body? But I do journal every day, writing things totally unrelated to my novel. Maybe I could use that time to write on a theme. Maybe that could lead to a collection of stories that would start to feel like a body of work. Thanks for the inspiration.